12 cardboard boxes, 11 stones, 3 bricks, 3m2 of clear plastic sheeting and a single lane flyover with reinforced concrete column. 1 plastic tabletop, 5 plastic crates, 4 blankets, 3 carpets, 1m2 of astroturf, 5 kitchen cupboard doors, 1 bollard, 6 timber planks, 14 bricks or stones, 2 woven plastic carry bags, 30 wooden pegs and a 6 lane highway with reinforced concrete column. 5 plastic crates, 1 plastic bin, 7 cupboard doors, 6 sheets of medium density fibreboard or similar, 2 sheets of polystyrene sheeting, 12m2 of plastic sheeting, 7 cardboard boxes, 2 mop sticks and a single lane flyover with reinforced concrete column. 1 cast iron fence with spikes, 20m2 of black and clear plastic sheeting, 2 timber planks, 4 sheets of composite wood, 5 cardboard boxes, 12 stones or bricks, 1 steel-framed chair. Sleeps 3 to 4 people. 18m2 of carpet underfelt, 15m2 of black or blue plastic sheeting, 7 cardboard boxes, 3 tires, 1 bollard, 1 marble countertop, 16 stones or bricks, 8 cupboard doors or sheets of composite wood and a 6 lane coffered highway with reinforced concrete column. Sleeps 2 to 3 people. 1 Maserati Grancabrio cover, 11m2 of clear plastic sheeting, 4 cupboard doors or sheets of composite wood, 8 stones, 1 broomstick and 1 tree canopy. A single lane flyover with reinforced concrete column and footing, 1 three-man tent, 1 blanket, 1 bag of sand and stones. Internal structure unknown. 3 blankets, 8m2 of corrugated cardboard, 12m2 of plastic sheeting, 7 cupboard doors or sheets of composite wood, 2 bollards, 14 stones or bricks, 1 wheelie-bin and a 6 lane highway with reinforced concrete column . Archival giclée print on Epson watercolour paper. 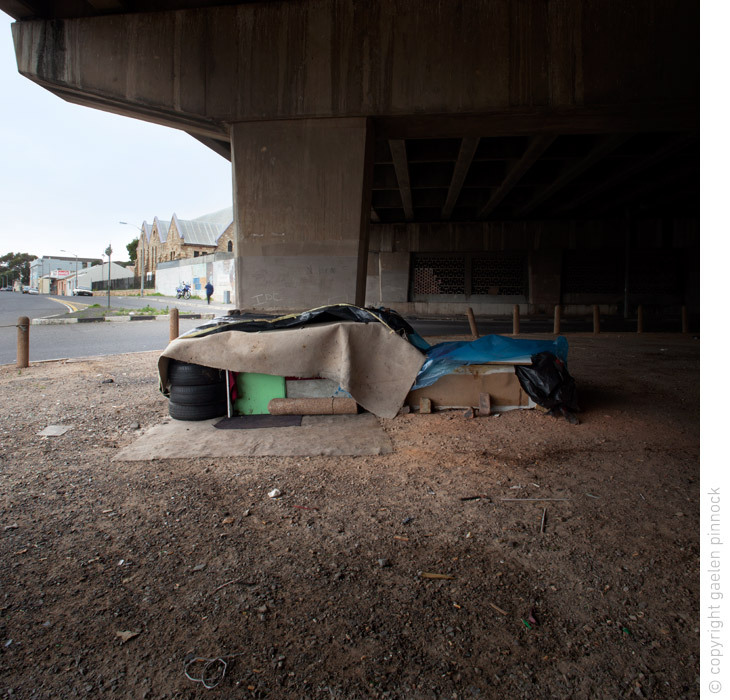 These photographs show various structures made by homeless people on the streets of Cape Town. 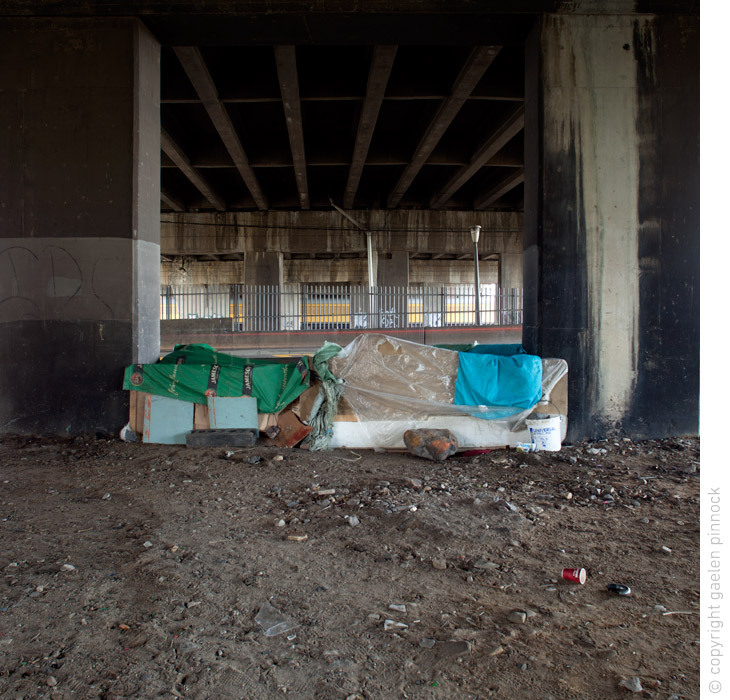 The urban homeless re-appropriate discarded objects and unused public space. Their temporary anthropomorphic structures change and move frequently. They close up in wet weather, or release their covers when it's warm. These shelters are made of whatever can be found. They are erected as needed or disassembled and packed into a shopping- trolley or wheelie-bin to be moved to a new location. The inhabitants of these dwellings are vulnerable. They have no social or financial capital and are often despised by people with fixed abodes. With Cape Town following a neoliberal path of gentrification, sanitisation and public space control by private organisations, homeless people are increasingly marginalised. They are being pushed out of the city as parks are fenced, soup-kitchens closed and intimidation by city officials and other private or semi-private entities increases. These homes are portable and resourceful. They are often well hidden, unseen or actively ignored. By documenting them in a formal architectural manner, I require the viewer to consider their legitimacy and both the plight and inginuity of those who construct them.